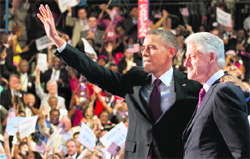 The two-term former US President, Bill Clinton, who spoke at the Democratic National Convention in Charlotte, North Carolina, brought the house to its feet as he passionately laid out the case for re-electing Barack Obama as the President of the United States of America and meticulously punched holes in the Republican nominee’s agenda. At least 60 persons died and many were missing after a boat carrying illegal migrants sank off Turkey's western Aegean coast today morning, Turkish media reported. Pakistan has deployed large contingents of the army and the police at one of the country's biggest nuclear facilities in Dera Ghazi Khan in the Punjab province following intelligence interceptions of a strike threat from terrorists. Widening its probe net in the multi-billion rupees Ephedrine scam, Pakistan’s Anti-Narcotics Force (ANF) has decided to investigate former Prime Minister Yousuf Raza Gilani. Gilani’s son is also implicated in the scam. Indian-American NASA astronaut Sunita Williams and her Japanese colleague successfully replaced a vital power unit on the International Space Station using tools made out of a toothbrush. Clinton nominated Obama as the Democratic Party's presidential candidate. He characteristically strayed from the written text of his remarks and spoke for over three quarters of an hour, by far the longest speech of the convention so far. But no one seemed to mind. Clinton reminded the audience that when Obama came to office in January 2009 he inherited an economy that was in free fall and hemorrhaging jobs. “In Tampa, the Republican argument against the President’s re-election was actually pretty simple, pretty snappy. It went something like this: We left him a total mess. He hasn’t cleaned it up fast enough, so fire him and put us back in,” he said to laughter and applause. The Republican Party held its convention in Tampa, Florida, last week at which it nominated former Massachusetts Governor Mitt Romney as its presidential candidate. Wisconsin Congressman Paul Ryan is Romney’s running mate. Clinton acknowledged that Obama faces a challenge that he too faced when he ran for re-election. Many Americans are still angry and frustrated with the economy. “If you look at the numbers, you know employment is growing, banks are beginning to lend again, and in a lot of places, housing prices have even began to pick up. But too many people do not feel it yet,” he said. The former President painted a sharp contrast between the Democrats and Republicans recalling that he worked with Republican President Ronald Reagan, and continues to collaborate on charitable causes with two other former Republican presidents -- George HW Bush and George W Bush. Congressional Republicans, on the other hand, had made it a priority to obstruct Obama, he said. He paid tribute to Obama’s spirit of bipartisanship noting that the President had appointed Republican Cabinet secretaries in his administration, as well as former political rivals such as Vice-President Joe Biden and Clinton’s wife, Hillary Rodham Clinton, as secretary of state. “Democracy does not have to be a blood sport. It can be an honourable enterprise,” Clinton said. On the other hand, Senate Republican leader Mitch McConnell had revealed that their party’s number one priority was to get Obama out of office, Clinton reminded the crowd. “We’re going to keep President Obama on the job,” he said to roars of approval. “Romney and Ryan have tried to look like an acceptable, moderate alternative to Obama, but they couldn’t say much about the ideas they have offered over the past two years,” Clinton said. Hillary and Clinton’s former Vice-President Al Gore were notably absent from the convention on Wednesday night. Hillary, who fought Obama for the Democratic Party’s nomination in 2008, was travelling in East Timor. Speaking live on state television TRT, Tahsin Kurtbeyoglu, the governor of Menderes, a coastal district in Izmir province, confirmed the sinking. TRT reported that the boat had sunk around dawn after travelling just 50 m from the Turkish coast. Television footage showed small boats searching for survivors close to the shore. State-run Anatolia news agency, citing Kurtbeyoglu, said on its website that most of those on the boat were Palestinian nationals and that the destination of the boat was not known. So far 46 persons have been rescued alive, Anatolia reported, including the boat's captain and his assistant, who have both been arrested. Those rescued were in good health, it said. Security was beefed at sensitive installations, specially at nuclear sites, to avert any attack on the lines of one on the Kamra airbase, during the Pakistan Defence Day, which is being observed today, officials said. "There have been threats to all installations, including the Dera Ghazi Khan nuclear site," Dera Ghazi Khan district police chief Chaudhry Saleem told PTI over phone. "After the attack on the Kamra airbase, we have been asked to remain extra vigilant. Police divisions are ready to respond to any emergency call," he said. Security had been enhanced around the nuclear site in Dera Ghazi Khan after the attack on the Kamra airbase on August 16, he said. A Lahore police official said a circular issued by the Punjab police chief's office had directed the police chiefs of 36 districts to beef up security around sensitive installations due to "credible reports of attacks by terrorists". Earlier, The Express Tribune reported that security had been stepped up at the nuclear facility in Dera Ghazi Khan after the ISI intercepted a telephone call during which militants were heard discussing an attack on the installation. The daily quoted sources in the military and the Punjab police as saying that the nature of threat at the nuclear installation is "serious", with an 80 per cent chance of occurrence. The ANF has begun queries on charges that the former premier illegally posted a former senior bureaucrat as the acting Federal Investigation Agency (FIA), ostensibly to derail the investigations. Express News quoted sources as saying that Gilani had transferred secretary of the Ministry of Narcotics Control Zafar Abbas Lak and posted him as the DG-FIA for “special tasks”. Sources said Lak was promoted from a grade-21 post to a grade-22 post within a few hours. He had oversight in the investigations of Gilani’s son Ali Musa Gilani in the Ephedrine case. The decision to use a toothbrush to clean a bolt that gave Williams and Akihiko Hoshide trouble during a marathon 8-hour spacewalk last week, was made during a brainstorming session between the astronauts and NASA engineers on the ground. They were trying to replace an electrical switching unit, but they couldn't bolt it to the outside of the station, the NBC News.Com reported. This was actually an extra spacewalk tacked onto their mission after the stuck space station bolt prevented the astronauts from properly installing the power unit 'MBSUs' on the outpost's backbone-like truss on August 30. The International Space Station has four 100-kg MBSUs that harness power from the outpost's solar arrays and distribute it throughout the orbiting complex. The station had been unable to relay power from two of the eight solar arrays on the massive orbiting complex without the use of one unit. "Looks like you guys just fixed the station," astronaut Jack Fischer radioed from Mission Control at NASA's Johnson Space Centre in Houston.